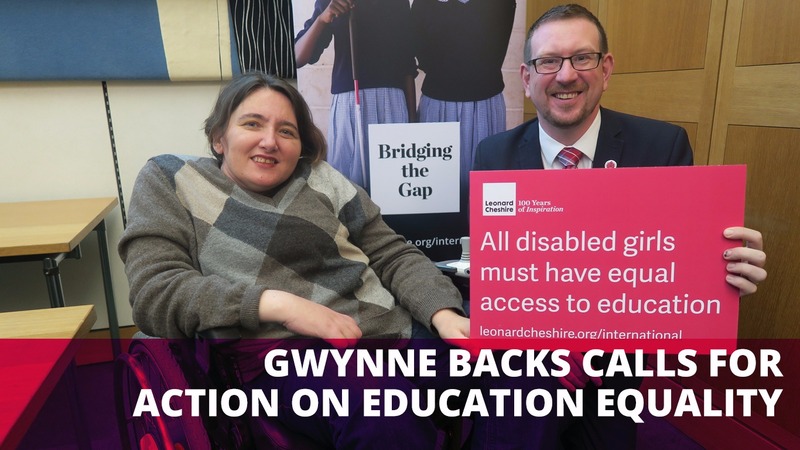 Denton and Reddish MP, Andrew Gwynne, joined the UK based Leonard Cheshire Disability charity last week in parliament to mark the International Day of Persons with Disabilities and support their campaign to “leave no one behind”. The 2030 Agenda for Sustainable Development pledges to “leave no one behind”, yet a recent report by Leonard Cheshire and the United Nations Girls Education Initiative (UNGEI) revealed that only 10% of children with disabilities in developing countries go to school. The global literacy rate for adults with disabilities is as low as 3 per cent, and 1 per cent for women with disabilities, according to a 1998 UNDP study. Less than 42% of women with disabilities have completed primary school education. Girls with disabilities are less likely to enrol in education, and have lower rates of attendance and completion, making disability one of the most prominent factors in educational marginalisation. For girls with disabilities, the situation is even more challenging; due to gender norms and practices common in many developing countries, they face triple discrimination, on the basis of their poverty, disability and gender. Leonard Cheshire Disability runs a number of programmes aimed at improving access to inclusive education for disabled children, particularly girls, and employment opportunities for disabled people in 13 countries across Africa and Asia. Most recently, Leonard Cheshire has been working to support girls with disabilities to meet their educational opportunities in 50 primary schools in Kenya through its Girls’ Education Challenge project, funded by the UK Department for International Development, which tackles the barriers girls face in accessing a quality education. “I was delighted to join Leonard Cheshire Disability to help mark the International Day of Persons with Disabilities. The important research Leonard Cheshire has conducted into girls’ education shows the additional barriers girls with disability face in accessing an education. “Around the world, people with disabilities are often significantly poorer, significantly less likely to reach school or to receive a comparable quality of education, and significantly less likely to secure employment or livelihoods.